Barnes DKA, Morley SA, Bell J, Brewin P, Brigden K, Collins M, Glass T, Goodall-Copestake WP, Henry L, Laptikhovsky V & Piechaud N 2018. Marine plastics threaten giant Atlantic Marine Protected Areas. Current Biology, 28(19), pp.R1137-R1138 DOI. Ross, R.E., Nimmo-Smith, W.A.M., Howell, K.L. (2016) Increasing the depth of current understanding: Sensitivity testing of deep-sea larval dispersal models for ecologists. PLOS ONE 11(8): e0161220. Howell, K.L., Piechaud, N., Downie, A.L., Kenny, A. (2016) The distribution of deep-sea sponge aggregations in the North Atlantic and implications for their effective spatial management. Deep Sea Research Part I,115: 309–320. Amaro, T., V. A. I. Huvenne, A. L. Allcock, T. Aslam, J. S.Davies, R. Danovaro, H. C. De Stigter, Duineveldi, G.C.A. , Gambig, C., Gooday,A.J., Gunton, L.M., Halld, R., Howell, K.L., Ingels, J., Kiriakoulakis,K., Kershaw, C.E., Lavaleye, M.S.S., Robert, K., Stewart, H., Van Rooij, D.,White, M., Wilson, A.M., (2016) The Whittard Canyon–A case study of submarine canyon processes. Progress in Oceanography 146: 38-57. Marshall, C. E., Glegg, G. A., & Howell, K. L. (2014). Species distribution modelling to support marine conservation planning: The next steps. Marine Policy, 45, 330-332. Wagstaff, M. C., Howell, K. L., Bett, B. J., Billett, D. S., Brault, S., Stuart, C. T., & Rex, M. A. (2014). β-diversity of deep-sea holothurians and asteroids along a bathymetric gradient (NE Atlantic). Marine Ecology Progress Series, 508, 177-185. Holt, R.E., Foggo, A., Neat, F., Howell, K.L. (2013) Distribution Patterns and Sexual Segregation in Chimaeras, Implications for Conservation and Management. ICES Journal of Marine Science. 70(6), 1198-1205. Narayanaswamy, B.E., Hughes, D.J., Howell, K.L., Davies, J., Jacobs, C. (2013) First observations of megafaunal communities inhabiting George Bligh Bank, North East Atlantic. Deep Sea Research Part II: Topical Studies in Oceanography. In Press http://dx.doi.org/10.1016/j.dsr2.2013.03.004i. Foster, N. L., Foggo, A., & Howell, K. L. (2013). Using Species-Area Relationships to Inform Baseline Conservation Targets for the Deep North East Atlantic. PloS one, 8(3), e58941. Galparsoro, I., Connor, D.W., Borja, A., Aish, A., Amorim, P., Bajjouk, T., Chambers, C., Coggan, R., Dirberg, G., Ellwood, H., Evans, D., Goodin, K.L., Grehan, A., Haldin, J., Howell, K., Jenkins, C., Giulia Mo, M., Buhl-Mortensen, P., Pearce, B., et al. (2012) Using EUNIS habitat classification for benthic mapping in European seas: Present concerns and future needs. Marine Pollution Bulletin. 64, 2630-2638. Howell, K.L., Holt, R., Pulido Endrino, I., Stewart, H. (2011) When the species is also a habitat: comparing the predictively modelled distributions of Lophelia pertusa and the reef habitat it forms. Biological Conservation. 144, 2656–2665. Heymans, J.J., Howell, K.L., Ayers, M., Burrows, M.T., Gordon, J.D.M., Jones, E.G., Neat, F. (2010) Do we have enough information to apply the ecosystem approach to management of deep-sea fisheries? An example from the West of Scotland. ICES Journal of Marine Science. 68, 265-280. Howell, K.L., Mowles S., and Foggo, A. (2010) Mounting evidence: near-slope seamounts are faunally indistinct from an adjacent bank. Marine Ecology. 31, 52-62. Howell, K.L. (2010) A benthic classification system to aid in the implementation of marine protected area networks in the deep / high seas of the NE Atlantic. Biological Conservation. 143, 1041–1056. Howell, K.L., Davies J.S., and Narayanaswamy, B.E. (2010). 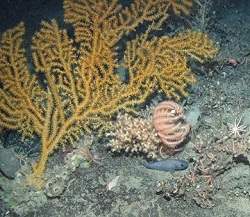 Identifying deep-sea megafaunal epibenthic assemblages for use in habitat mapping and marine protected area network design. Journal of the Marine Biological Association of the United Kingdom, 90 , pp 33-68 .